We take you to one of the most famous and scenic British main lines at the time of the transition from steam to diesel power. With 10 different types of locomotives and dozens of rolling stock items at your disposal you decide what train to drive. Sessions featuring Anglo-Scottish expresses, local stopping trains, fast freights, heavy mineral, slow pickup goods or trip workings offer a rich variety of services for your enjoyment. The 87 mile route from Skipton to Carlisle over the wild and remote Pennine moors will test your driving skills and ability to keep to schedule. Prototypical topography, track plans, gradients, stations, signal boxes and signal placement, viaducts and tunnels will complete your experience. 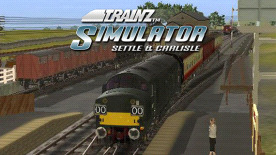 With “Trainz Simulator: Settle and Carlisle” you will almost believe that you are there.